How can we use satellite observations of air pollutants beyond academia? Air pollution monitoring from space can be performed over different type of sources, such as cities (where emission are dominated by the contribution of transportation), industrial areas or power plants. One of the main advantages of satellite observations is their global coverage. This allows for example to compare the pollution levels over different countries or to evaluate how they change over time. This feature makes them particularly useful for monitoring air quality in developing countries, where no comprehensive ground-based air quality monitoring network is typically available or air quality information are not available as open data. For example, in a rapidly developing country like India, satellite atmospheric data can come in handy for monitoring the polluting emissions from coal-based energy production, atmospheric particulate matter (aerosol) emitted by crop burning and outdoor cooking and increased industrial activity and urbanisation. The general lack of polluting emission regulations in the country further increase the negative effects of air pollution on the human health of local populations. But what else is out there? One approach that has been overlooked, is based on the idea to combine satellite-based atmospheric data with auxiliary non-geophysical information, such as socio-economic data, population changes, health impact, trade indexes as well as information on corporate environmental responsibility performance. How can these different data be combined together and how do they correlate to each others? Also, is there a link between air pollution levels and politics? Is poverty related to bad air quality or democracy to clean air? All these global questions are open and satellite-based observations of air pollutants might help in providing an answer. And what about the users? Accurate information on air pollutants are needed by decision-makers from both public and private sector: city environmental authorities, companies trying to reduce their environmental impact and to achieve their sustainability goals, policy makers planning new emission control regulations, teachers at school looking for updated educational material, citizens interested in getting information on air quality issue all over the world. 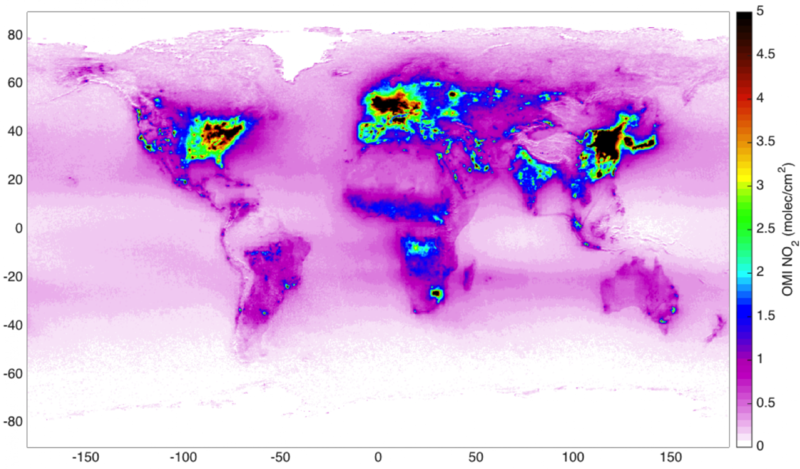 The potential applications of satellite-based observations of air pollutants are many. Are we up for the challenge?